Apollo C. Quiboloy Exposed — Warning! False Prophet! "This is very important, because once this has been declared the Lord will have a residence here. Whoever He chooses to dwell in, automatically, that is the Son. That is the body. The Deliverer has come! The Father has come! He has come because He found Himself a body. He has come in a manner that they did not expect. "For many shall come in my name, saying, I am Christ; and shall deceive many." "In the year 2000, He came in a manner they did not expect. Because when He comes, He is going to find a body that came from the race of the first Adam. It was really the first Adam who lost and fell in out of the grace of God and is to be redeemed. "One day, somebody (APOLLO QUIBOLOY) was born on a cold Tamayong night. In due time, that body was appointed to its place in God's history. He was to take up from God the Father the scepter of the Sonship. That time has come." 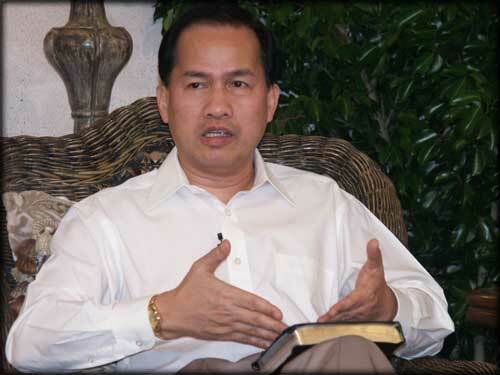 Apollo Quiboloy is an ANTI-Christ, a false prophet teaching DAMNABLE HERESIES! Quiboloy has an international following. DANGER... Stay away from Apollo Quiboloy's heretical ministry (website at www.kingdomofjesuschrist.org). "And Jesus answered and said unto them, Take heed that no man deceive you. For many shall come in my name, saying, I am Christ; and shall deceive many." Baguio City, Benguet, Philippines -- A mother's plea to reclaim custody of her daughter from a television evangelist has made a Mindanao-based Church ministry the target of an investigation by the city council and government social workers. Councilor Jose Molintas presented to the council on Monday a documented report on Erlinda Rillon, 60, mother of Arlene, a 19-year-old recruit of the Kingdom of Jesus Christ, Name Above Every Name Inc.
Rillon claimed that Church founder and leader, Apollo Quiboloy, had been luring teenagers and young adults from Baguio to operate Quiboloy's ministry in Barangay Catitipan in Davao City. Rillon said she wrote Social Welfare Secretary Corazon Soliman about her situation, after learning that Quiboloy had asserted the separation of Church and state in rebuffing government mediators. Several evangelical groups in Baguio have also started a letter campaign, on Rillon's request, to ask Quiboloy to release Arlene. Joy Adaclog, the social worker assigned to Arlene's case, said the Department of Social Welfare and Development had asked Quiboloy to allow government psychologists to counsel Arlene "in the spirit of Christianity." She has yet to receive a response from Davao. Jose Luis De Jesus Miranda EXPOSED!